Which 2013 Tablet is Best for Gaming? HTC One is the best smartphone today in the mobile market that runs on Android operating system. But though it is one of the best, still one can’t unleash all of its potential unless you root it. But what you can do once you have rooted your HTC One? You can do a lot of things once you have rooted your smartphone, but one of the biggest reasons why people root their device is that they want to customize it the way they want. And to try out new Custom ROMs on it. The Stock ROM is one boring thing, but a Custom ROM isn’t. So here I will be giving you 3 of the best Custom ROMs for HTC One that you can install on your smartphone. Note that, to install a Custom ROM, your phone must be rooted and must have CWM recovery installed on it. Disclaimer: We are NOT the developers of any of the Custom ROMs listed below. Flashing a Custom ROM on your smartphone might prove risky or you might brick your phone. We or the developers are not at all responsible if your device is damaged. So proceed at your OWN risk! Android Revolution HD is one of the best ROMs for HTC One as it comes with some unique points that make it the one of the best. The Custom ROM is based on Android 4.2.2 Jelly Bean and is quite popular among the Android fanboys. The Custom ROM doesn’t do any visual changes to the device and you will feel as if you are using the same stock ROM on your HTC One but it do bring a lot of performance tweaks and gives a much better performance. The ROM also gives a good battery backup and once you install it you won’t be disappointed with it. It surely is one of the best Custom ROMs for HTC One M7. Whenever you ask any one what’s the best Custom ROM for an Android device, most of the time you will hear only one name, CyanogenMod. And its true! CyanogenMod is considered to be one of the best ROMs for any smartphone. CyanogenMod is known for building bug-free ROMs and they have developed CyanogenMod 10.1 ROM for HTC One as well. The ROM is based on Android 4.2.2 and it brings a lot of changes, both performance wise as well as visual changes to your smartphone. It is considered as one of the best Custom ROMs for HTC One as it is backed up by a team of skilled and dedicated developers, so you won’t face any problems. TrickDroid Custom ROM can also be considered as one of the best Custom ROMs for HTC One because it brings in some cool new changes to your smartphone and the ROM is based on Android 4.2.2 Jelly bean. The Custom ROM lets you enjoy some new features on your HTC One like the Sense 5.0 and the Android 4.2.2 Jelly Bean experience. Some of the features that come with the ROM are Advanced Power Menu, multi-language support, bug fixes, Menu tweaks, better camera options and lots more. And the ROM is simple, clean and fast. 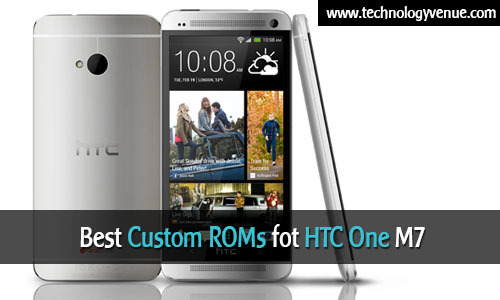 The top 3 Custom ROMs that you can install on your HTC One are the ones that are listed above. The list doesn’t end here as there are still many ROMs available to install on the device. Read: How to Update HTC One to Android 4.3 JB CyanogenMod 10.2? But the above 3 are considered to be the best ones. If you think that there is some other Custom ROM that comes with better features and I missed that in the article, then feel free to share them in the comments section below. I would love to hear your views on the best Custom ROMs for HTC One, so do share them. How to Update HTC One to Android 4.3 JB CyanogenMod 10.2?